Now let us show you around the new TravelMate computer. Also called LCD (liquid-crystal display), displays computer output. Electromagnetic resonate (EMR) stylus is used to input data in tablet mode. Use only an EMR-compatible stylus to input data on the screeen. Escape button for use in tablet PC mode. Function button for use in tablet PC mode. 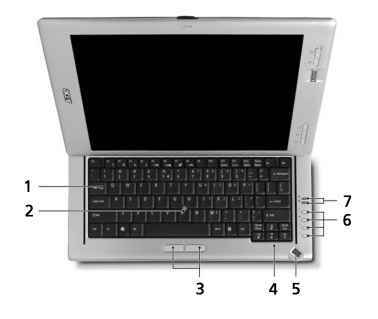 Screen rotate button for use in tablet PC mode. 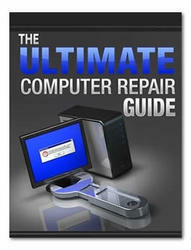 Provides fingerprint-verified access to operating system applications. A tablet-mode button, it functions like CLT-ALT-DEL to lock the access to the operating system. For entering data in notebook PC mode. Touch-sensitive pointing device which functions likea computer mouse when used together with the click buttons. Function like the left and right mouse buttons when used together with the center-keyboard trackpoint. For up, down and one-touch accelerated scrolling. Buttons for launching frequently used programs. Light up when Caps Lock or Num Lock are activated. Press to enable/disable the wireless function. Lights to indicated the status of wireless LAN communication. Press to enable/disable Bluetooth functions. Lights to indicated the status of Bluetooth communications. Lights up when battery is being charged. Interfaces with infrared printers, computers and other FIR-aware devices. Indicates when the hard disk drive is active. For entering data in tablet PC mode. Connects to a gigabit Ethernet network. Connects to a phone line. Accepts recordable DVDs and CDs, depending on teh drive type. Lights up when the optical drive is active. Ejects the optical drive tray. Ejects the optical drive tray when the computer is turned off.Lights up when computer is off. Accepts one Type II PC Card. Eject the PC Card from the slot. Accepts Memory Stick, Memory Stick Pro, MultiMediaCard (MMC), Secure Digital (SD). Note: Only one card can operate at any given time. Connects to audio line-out devices. Accepts audio line-in devices (e.g. microphone or audio CD player). 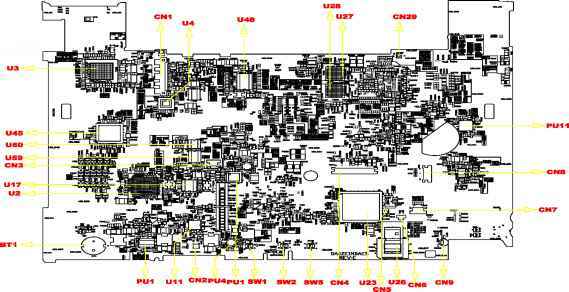 Connects to IEEE 1394 devices. Connects to USB 2.0 devices (e.g. USB mouse or camera). Keep computer cool during use. Connects to a display device (e.g. monitor or projector). Connects to a Kensington-compatible computer security lock. 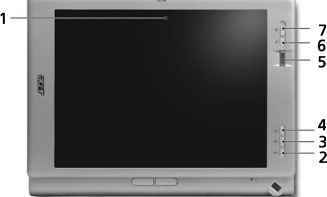 Locks and release the LCD unit to convert from tablet to notebook mode. Connects to an Acer ezDock (optional). Locks the battery in place. Houses the computer's main memory (secured with two screws). QOtg: Do not cover or obstruct the opening of the fan. Houses the computer's hard disk (secured with two screws). 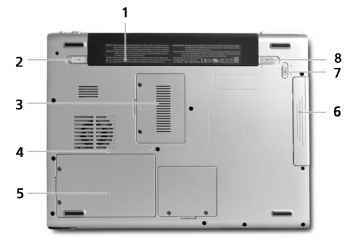 Internal optical drive (hot -swappable Acer MediaBay drive moudel is optional). Release the optical drive module fo removal. How to instal travelmate c110 touchscreen?